Learn how Office Ally's Certified EHR can help you achieve Meaningful Use! 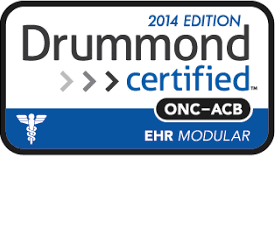 This Complete EHR, EHR 24/7™ is 2014 Edition compliant and has been certified by an ONC-ACB in accordance with the applicable certification criteria adopted by the Secretary of the U.S. Department of Health and Human Services. This certification does not represent an endorsement by the U.S. Department of Health and Human Services. Office Ally’s EHR 24/7™ is available for a flat monthly fee with the option to add eRx for no additional cost. *To determine the correct EHR 24/7 version, locate the appropriate reporting period and the corresponding version. Example 1 - If you were attesting to a 90 day reporting period from 01/01/2014-03/31/2014, you would use v3.7 when attesting. Example 2 - If you were attesting to a 90 day reporting period from 07/01/2014-09/30/2014, you would use both v3.7 and v3.8 when attesting. Example 3 - If you were attesting to a 90 day reporting period from 05/01/2015-07/29/2015, then you would use both v3.8 and v3.9.0 when attesting. Additional software relied upon to certify: MedlinePlus Connect, PubMed, PopHealth. Additional software relied upon to certify: MedlinePlus Connect, NewCropRx, PubMed, PopHealth.